Short of being very pregnant, no-one wants their stomach to be the first part of their body that enters a room. 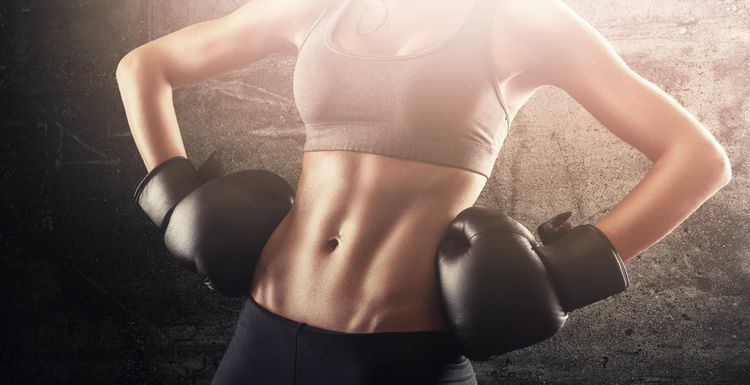 The holy grail of a toned flat abdomen has two prongs – the right food and the right exercise. All the toning exercise in the world won’t do the trick if the muscles are hidden under too much body fat. Have a look at your total calorie intake, and make sure you are getting the right mix of food. Some foods may give your metabolism a small boost. The difference won’t be much but it all helps, so try some different tastes while you are it. Meeting the recommended target of 150 minutes of cardio will go a long way towards busting that belly. Cardio exercise uses calories which will reduce fat. Try and increase the cardio time in the last two weeks, to use up even more of that fat. Now for the targeted stuff. There are three sets of muscles that pull your stomach in, and you need to work all of them. The plank pose will do just that. Planks may look easy, but they are a serious workout and need to be done correctly. Make sure you don’t let your back sag downwards. Wearing trainers will make it easier to keep yourself supported. The final step is to turn up the tone with crunches. Again, technique is crucial for the crunch. Make sure your hands are behind your head to support it, but not to push it forward. There are lots of variations as you get fitter. A strong stomach is not just about appearance. It protects your back and gives you the benefits of better posture. Those four weeks of hard work are the route to long term good health. Thankfully the rubbish weather means I can still hide my belly but I will start this today in the hope that in a month's time we'll have enough sunshine to bare our midriffs in. I notice that extra weight goes straight to my stomach, so it really does all start with the right amount of food. Working on a look like the photo - one day!